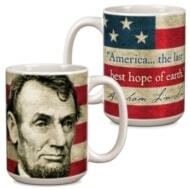 Mug: Lincoln "America...the Last Best Hope of Earth"
Abraham Lincoln: "America...the last best hope of earth" mug. 15 ounce ceramic mug. Patriotic.